Diplomats may have a reputation for greyness, obfuscation, even hypocrisy, but few have found themselves compared to a serial killer, let alone one who devours human flesh. That honour befell Laars Faaborg-Andersen, the European Union’s ambassador to Israel, last week when Jewish settlers launched a social media campaign casting him as Hannibal Lecter, the terrifying character from the film Silence of the Lambs. An image of the Danish diplomat wearing Lecter’s prison face-mask was supposed to suggest that Europe needs similar muzzling. The settlers’ grievance relates to European aid, which has provided temporary shelter to Palestinian Bedouin families after the Israeli army demolished their homes in the occupied territories near Jerusalem. The emergency housing has helped them remain on land coveted by Israel and the settlers. European officials, outraged by the Lecter comparison, have reminded Tel Aviv that, were it to abide by international law, Israel – not the EU – would be taking responsibility for these families’ welfare. While Europe may think of itself as part of an enlightened West, using aid to defend Palestinians’ rights, the reality is less reassuring. The aid may actually be making things significantly worse. Shir Hever, an Israeli economist who has spent years piecing together the murky economics of the occupation, recently published a report that makes shocking reading. Like others, he believes international aid has allowed Israel to avoid footing the bill for its decades-old occuption. But he goes further. His astonishing conclusion – one that may surprise Israel’s settlers – is that at least 78 per cent of humanitarian aid intended for Palestinians ends up in Israel’s coffers. The sums involved are huge. The Palestinians under occupation are among the most aid-dependent in the world, receiving more than $2bn from the international community a year. According to Hever, donors could be directly subsidising up to a third of the occupation’s costs. Other forms of Israeli profiteering have been identified in previous studies. In 2013 the World Bank very conservatively estimated that the Palestinians lose at least $3.4bn a year in resources plundered by Israel. Further, Israel’s refusal to make peace with the Palestinians, and as a consequence the rest of the region, is used to justify Washington’s annual $3bn in military aid. Israel also uses the occupied territories as laboratories for testing weapons and surveillance systems on Palestinians – and then exports its expertise. Israel’s military and cyber industries are hugely profitable, generating many billions of dollars of income each year. A survey published last week found tiny Israel to be the eighth most powerful country in the world. But whereas these income streams are a recognisable, if troubling, windfall from Israel’s occupation, western humanitarian aid to the Palestinians is clearly intended for the victims, not the victors. So how is Israel creaming off so much? The problem, says Hever, is Israel’s self-imposed role as mediator. To reach the Palestinians, donors have no choice but to go through Israel. This provides ripe opportunities for what he terms “aid subversion” and “aid diversion”. The first results from the Palestinians being a captive market. They have access to few goods and services that are not Israeli. Who Profits?, an Israeli organisation monitoring the economic benefits for Israel in the occupation, assesses that dairy firm Tnuva enjoys a monopoly in the West Bank worth $60 million annually. Aid diversion, meanwhile, occurs because Israel controls all movement of people and goods. Israeli restrictions mean it gets to charge for transportation and storage, and levy “security” fees. Other studies have identified additional profits from “aid destruction”. When Israel wrecks foreign-funded aid projects, Palestinians lose – but Israel often benefits. 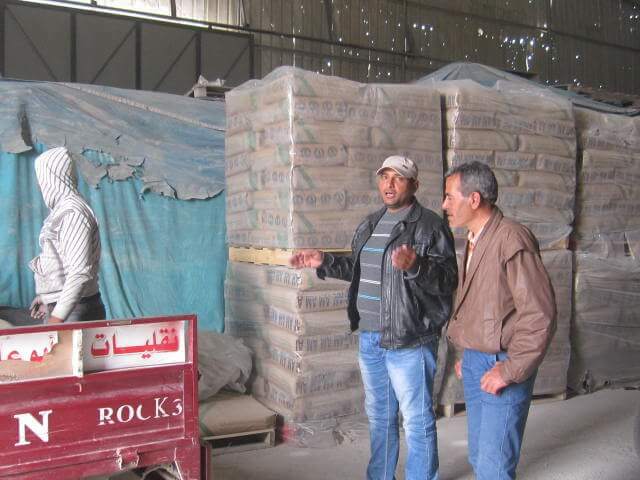 Cement-maker Nesher, for example, is reported to control 85 per cent of all construction by Israelis and Palestinians, including the supplies for rebuilding efforts in Gaza after Israel’s repeated rampages. Significant segments of Israeli society, aside from those in the security industries, are lining their pockets from the occupation. Paradoxically, the label “the most aid-dependent people in the world” – usually affixed to the Palestinians – might be better used to describe Israelis. What can be done? International law expert Richard Falk notes that Israel is exploiting an aid oversight vacuum: there are no requirements on donors to ensure their money reaches the intended recipients. What the international community has done over the past 20 years of the Oslo process – inadvertently or otherwise – is offer Israel financial incentives to stabilise and entrench its rule over the Palestinians. It can do so relatively cost-free. While Europe and Washington have tried to beat Israel with a small diplomatic stick to release its hold on the occupied territories, at the same time they dangle juicy financial carrots to encourage Israel to tighten its grip. There is a small ray of hope. Western aid policy does not have to be self-sabotaging. Hever’s study indicates that Israel has grown as reliant on Palestinian aid as the Palestinians themselves. The EU noted last week that Israel not Brussels should be caring for the Bedouin it has left homeless. Europe could take its own advice to heart and start shifting the true costs of the occupation back on to Israel. That may happen soon enough whatever the west decides, if – as even Israel is predicting will occur soon – the Palestinian Authority of Mahmoud Abbas collapses.